“Where Did All The Hippies Go? “ Is an ongoing body of work that currently comprises a site specific installation and 19 mixed media drawings made from Japanese aobana ink, watercolor, oil paint, salt and coffee on paper, ranging between 12”x18” and 14”x17” of portraits of political prisoners. This project is a collection of drawings exhuming an alternative Meta narrative that interlace scientific explorations of forms and abstractions in nature to explore new complexities between human existence, origins, and histories. The site specific installation, which was a second exploration on the theme of “Where Did All The Hippies Go” is created entirely with Painters tape and its size is 8'x6'x8' modeled after the size of a solitary confinement cell in Rikers Island. 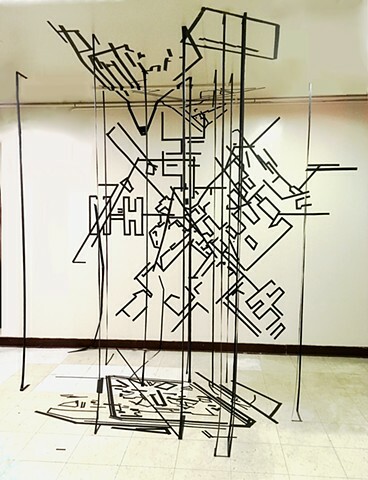 Painters tape functions as a drawing tool creating lines and forms depicting the aerial view of the Angola Prison in Louisiana and the Mahanoy State penitentiary in Pennsylvania, creating constructivist abstractions that physically supports and binds the piece together while simultaneously sprawling over and obscuring the site specific environment. The painters tape also divides physical space between the representations on the wall creating boundaries in 3 dimensional space, a fragile and malleable material becomes dense and permanent.